Our fun continues on Thursday nights at Long Draw Pizza with Russ singing for us and Nancy cooking pizza. If you look close at our hats in one of the pictures from Long Draw you might notice new silver hatbands. One of our friends from B.J.’s RV Park, Betty, showed us how to make them. They look great and have been getting a lot of compliments. Just don’t look too close; they are made out of beer can tabs. (TALK ABOUT RED NECK!) If you save your beer can tabs, about 64-70 of them, June can show you how to make one. June even showed Nancy how to make a Michigan pizza, better known as a BLT pizza. (bacon, lettuce, and tomato) If you like a BLT sandwich you will like one of these. We got an invitation from Russ and Birdie to come out to there place for a cook out. Of course we could not turn that down! Russ and Birdie put on a great feast with Russ kicking out some great margaritas. Another one of those hikes was made out into the park to see what we could find. This was to be Patti’s first major hike after removing her walking cast. Walking the washes down into a valley. We located petrified wood and some very interesting rocks. Too bad we were in the Park, as you cannot pick up anything in the Park and keep it. And of course, we can’t hike without eating lunch. After our meal, or snack, we pressed on and located an old oyster bed, left over from when this area was an ocean. All the shells are fossilized. Now it was time for the walk out and Larry and I wanted to find an easier way out. So I hiked up, what looked like an easy way out? It turned to be a very steep rocky climb, just on the edge of slipping. Once on top I looked around and yelled down, “You better go back out the same way.” Now as I looked around, some more, I thought I might be going back down the way I came up. But after some more climbing I was able to watch the group winding their way back out, from various vantage points, much like the Indians would have done. We all met up back where we started. Another great hike! With all the aching muscles from hiking it was time for a soak in the hot spring. 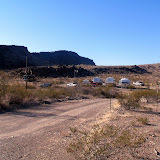 The hot spring is in Big Bend National Park, right on the Rio Grande. Back in the forties this area was a spa and we sit in the old foundation in the river, where the 104-degree water comes out. When you get too hot, you just swing your feet over the wall and into the river, or just jump right in. But don’t swim to the other side, this would be a major border issue, as you would be in Mexico, and subject to a $5,000 fine! Oh yes, I got dragged out for another round of GOLF, along with all the guys and girls! This may come as a surprise but the ball actually went straight most of the time! June and I started traveling 4 years ago during the winters. The first question was, can we stand each other 24/7? That question was answered after the first year when we bought a new trailer. We have been putting out a news letter to keep people informed. This is our first attempt at a blog.